There is a fundamental problem in the proposition that only the bottom 20 per cent poorest households can be targeted. The average income of the bottom 40 per cent of the population is below Rs 1.44 lakh per year. A scheme in which half of them will be given income transfers assumes that people do not change behaviour in response to government policies. The ‘Lucas critique’, a popular argument in economics in the context of macroeconomics, argues that it is naïve to assume that people do not respond to policy changes in a rational way. If we predict behaviour based on historical data, the predictions can often go wrong. The NYAY scheme is likely to suffer from a similar critique. We illustrate this below. (i) The average income of the bottom 20 per cent of the households is approximately Rs 77,000. This is the targeted group for the cash transfer. Households are to be given an additional Rs 72,000 so that their income becomes around Rs 1,44,000, to give them Rs 12,000 per month, the minimum basic income. 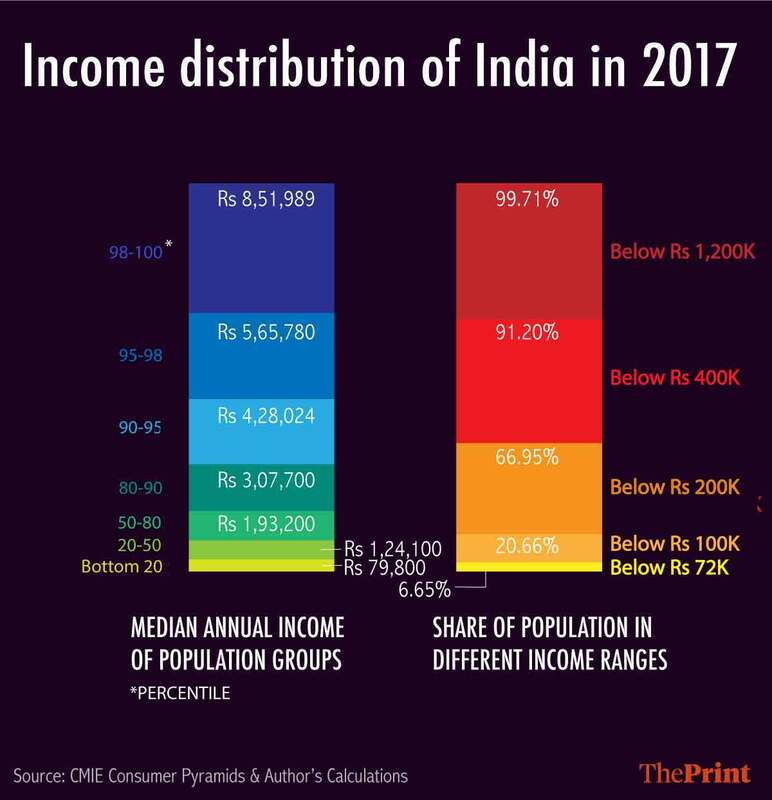 (ii) The average income of the next 30 per cent of households, those above the 20 per cent poor households being targeted and up to half the households in India, is Rs 1.25 lakh. After the income transfer to the poorest 20 per cent, those with income levels up to Rs 1.25 lakh will be poorer than those receiving income transfers. These households will be better off by not earning the Rs 1.25 lakh per year that they are currently earning, and dropping below the poverty line to avail of the income transfer. That way, they will be able to get incomes of Rs 1.44 lakh per year. If income is based on surveys such as NSSO, which have been used to measure household incomes and consumption, the rational response to a cash transfer scheme for families below Rs 72,000 will be for all families near that level or somewhat above it to report that their incomes are lower than they actually are. In any case, lines between Rs 6,000 per month and Rs 8,000 per month, especially when incomes are uncertain and seasonal and constantly fluctuating, are too thin and too difficult to identify. Even without the above scenario of a larger number of absolute poor, this scheme also raises questions about the fiscal cost and how the Congress plans to fund it. Rs 3.6 lakh crore or thereabouts is not a small sum. Considering how difficult it is for governments to reduce expenditure such as those on salaries or interest payments, the question is what expenditure will be reduced? Will it be the various existing schemes? If so, which ones? Will tax rates be raised? If tax rates are increased, will it be the GST rate? Or will GST still be lowered, as the Congress has indicated earlier? Will direct tax rates be increased beyond the present rates? Personal income tax slabs at the highest levels are already effectively at 33 per cent. If 18 per cent goes on average as consumption taxes (i.e. GST), then salaried middle-class households in India in this tax bracket are already paying 50 per cent of their income as taxes. Will the tax burden on them be increased? Budget 2019 barely managed to meet fiscal targets: Fiscal deficit numbers were kept in control by showing disinvestment targets met by sale of one PSU to another, bonds sold by PSUs and by postponing expenditures. Meeting deficit targets will be an equally tough challenge next year. In an economy where the biggest problem is employment, poverty reduction by income transfers is a palliative, but not a solution. Transfer payments need to be accompanied by a reform programme for increasing investment, growth and jobs. While cash transfers are the least distortionary way of poverty alleviation, they are not a long-term sustainable solution for income growth. The congress has introduced the NYAY to get agent , bureaucrats politician nexus back again into business . Because he has FAMILY as a unit . He has abandoned the well established Adhar based individual as a unit. It will be left to the Tahsildar , agent politician to identify the FAMILY . Also Family can be split to show lower income level. e.g. Grand father and son and grandson can show on paper that they are separate families, with the help of agent. By the way what will happen of a person who has four wives ? Nyay is not justice at all, but a ruse to create an illusion of fighting poverty (“garibi hatao!”, a dishonest slogan ever! ), in order to fool people like Raghuram Rajan and win elections. After that, a free for all for the corrupt relics of the dynasty and their “prostrate at the feet” cronies! Corruption angle need to be taken in consideration. In Goa pension scheme was introduced by late Manohar Parrikar for senior citizens widows. MLA were incharge of scheme one Congress MLA used call meeting after meeting forms were given to his trusted worker for distribution. This worker distributed forms to well of ineligible persons from his community. While Bhatkan (landlady) got pension her maid for whom scheme was intended for left out. While this proposal from Congress is definitely unworkable, we should have some more detailed ideas from Ila on poverty alleviation/reduction beyond generally saying that we should have programs for investment, growth and jobs. It is the specific, actionable programs that are required to be spelled out. If Congress says that it consulted many economists, including Raghuram Rajan (with details of the scheme worked out by Chidambaram), it shows how hallow their competence is. It is very interesting to note that beyond bottom 20% of the households, the next 30% of of the households have income very close to the bottom 20%. This means 50% of the households actually deserve some sort of income support, if indeed one wants to have it! This scheme will therefore keep everyone poor for ever to claim the income support! Raghuram Rajan has reduced himself to a moron. Rajan has always been a narcissist who has pathological love for the sound of his own voice. He is a business school professor who pretends to be an economist and acts like an activist and a politician. He was the worst choice to be a central banker. A central banker’s job is to work quietly in coordination with the government to discharge reserve bank’s responsibilities. A central banker is not an old west cowboy who is the law unto himself. But that’s exactly hiw Rajan behaved as the RBI governor. He was more interested in weekly television appearances, public lecturing and giving political commentary. I m glad he is no longer at the RBI. Ya right! So your solution is – transfer all the money to big corporates who will keep most of it safe and then invest may be just 10% of it, create jobs (highly exploitative and very few) and the economy shall boom. I don’t know how come these spokespersons of greedy corporates are even accepted as pop-economists. 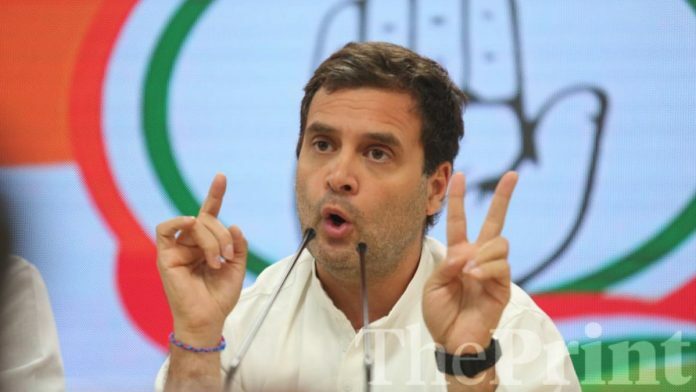 Yes it’s absolutely true it is not the answer to ending povertyRahul Gandhi’s promise of a minimum basic income, the biggest income transfer programme to be announced, is fraught with challenges.